On newsday at the Northern Television Center, the feeling in the air is one of intensity. General Manager of Broadcast News Allen May is going over scripts with producers, and NTC News Production Director Jennifer Corvino is helping students put together their video clips for the broadcast. May and Corvino are particularly excited because the NTC broadcast will be entirely digital for the first time, providing the highest-quality video in television news. When the news anchors arrive for their first-ever broadcast, the edited scripts have been finalized. The anchors are sat down and miked up and the final steps for broadcast are readied to go. Corvino, who also teaches several courses in broadcast journalism, said her favorite part of working with the students is, “I get to see them come together as a team. It’s really exciting to watch the mentorship between the newer and more experienced students.” The teamwork exhibited by the students was especially important today when the technical problems started to rear their ugly head, she explains. Fortunately, it’s early in the semester, and May and Corvino fully expect the students to progress professionally and quickly. With the broadcast completed, there is an air of relief in the studio. May and Corvino rally the students, knowing they have to do it all again twice the following week. The NTC experience is unlike any other—no professors at a lectern, behind a podium, writing with a grease pencil on an overhead projector or walking around putting questions to you. It embodies what NIU President Doug Baker refers to as the Triangle Offense, which connects students and faculty to the outside world. In May’s role as general manager of broadcast news, he can usually be found with one knee on the floor, the other bent at 90 degrees and his arm on the desk of a student sitting at her computer station, with four to six screens up, preparing her news story for broadcast the next day. He asks a series of questions, often rapid-fire. 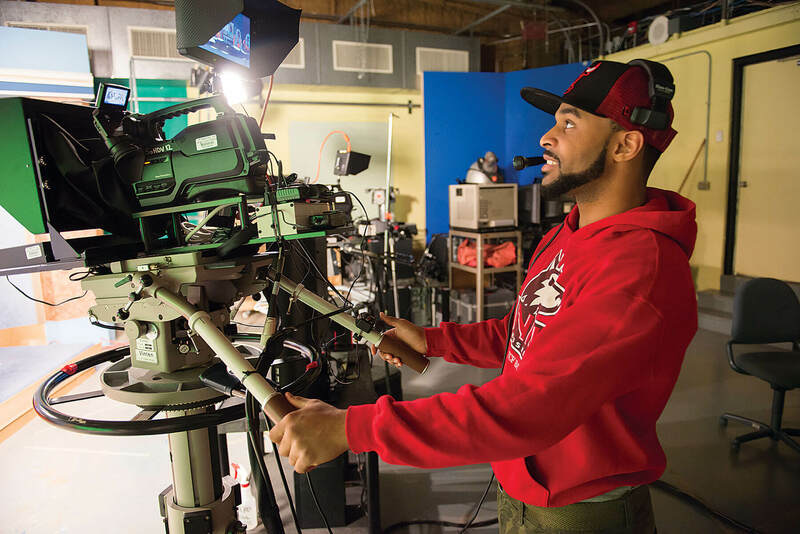 “I make them teach me,” he explains, noting that in today’s broadcast journalism world, the student is acting as not only the on-air reporter, but the camera-person, the sound-person, the writer and the producer of the assigned news story. 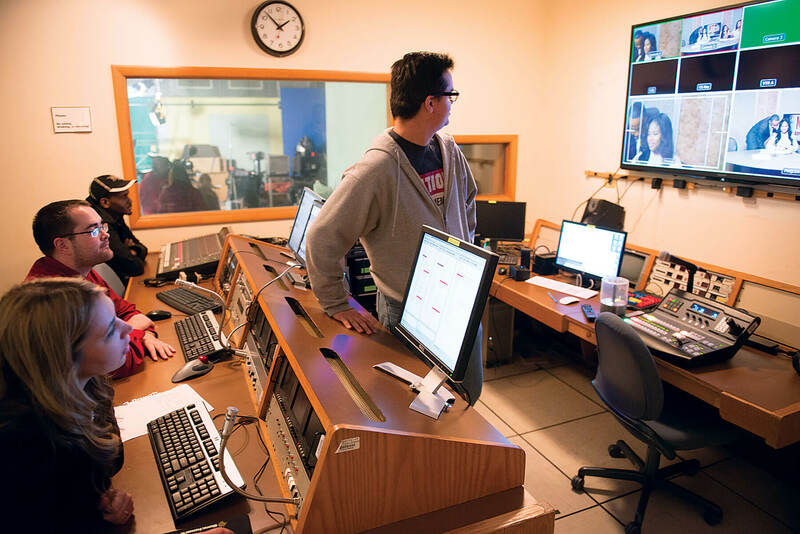 “The students are treated as adults working in a real newsroom, so they expect us to have a good grasp of what we’re doing and to be able to prove that to them,” says Student News Producer-Director Keisha Howerth, who has worked at NTC for the past three semesters. This is advanced television news writing and reporting. The students are preparing for their twice-weekly news broadcasts. “When they finish, they feel a sense of ownership, which is critical to developing the expertise they are going to need to work in broadcast journalism,” May says. And, increasingly, television newsrooms are filling up with NTC graduates. May lists a string of newer alumni who are working in Green Bay, Milwaukee, Denver and even Chicago. 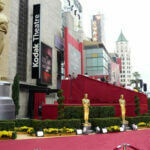 Two recent alumni have won Emmy Awards from the National Academy of Television Arts and Sciences Chicago/Midwest Chapter. Matt Knutson (‘05, B.A.) won an Emmy for Outstanding Crafts Achievement for On-Camera Talent–Program Correspondent/Narrator/Performer as a producer on the show Windy City LIVE!, WLS Chicago’s morning talk program. Amy Aiello (B.A., ‘05) won an Emmy for her photography on the WGN Morning Newscast, “Chicago Blackhawks Win the Stanley Cup.” Student Brittany Merleau was also nominated for a student achievement award for Best College Student Production–Newscast. Also, 2013-14 NTC students Merleau, Ericka Burgess, Trenier Ward, Richard Medlicott, Alan Kozeluh, Emilee Fannon, Sabrina Bennett, Brett Tudela, and Ericka Wilson all received top-three finalist Silver Dome Awards from the Illinois Broadcasters Association for Best TV Newscast for NTC News Tonight. Kozeluh received the Silver Dome Award for Best TV News Package. Former student Jorge Rodas, now a reporter at WBAY-TV in Green Bay, is among the program’s many success stories. In 2013, he won a Student Production Award from the Chicago/Midwest Chapter of the National Academy of Television Arts and Sciences at the annual NATAS Regional Emmy® Awards event in Chicago. His investigative feature on the State of Illinois pension system, entitled “Pension Games,” earned the award in the category of General Assignment TV Reporting. 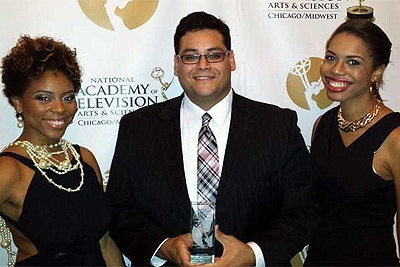 Jorge Rodas, flanked by Candice Beasley and Lauren Scott, shows off his hardware at the Chicago/Midwest Emmy® awards. “So many are getting their start at the Rockford stations that it seems like half the newsrooms look like my classes from the past couple of years,” May says, not without a bit of humble pride. May is in his 15th year managing the Northern Television Center. 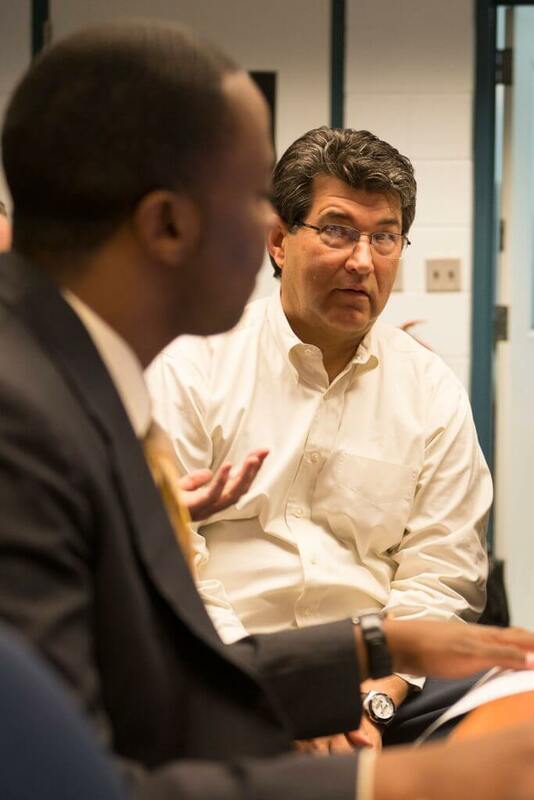 Prior to NIU, he accumulated 25 years of professional reporting experience in newspaper, radio and television, most recently at WTMJ-TV (NBC) in Milwaukee, where he headed the investigative news reporting team. He also worked in news at WFLD-TV (Fox) in Chicago and WISN-TV (ABC) in Milwaukee. He earned his juris doctorate from the University of Wisconsin-Madison in 1994. Students and alumni alike say the mentoring May provides is a major reason the experience at NTC provides translates to students’ career success. “The whole process is far from easy, but it’s a really great hands-on experience, and it’s given me a good idea of what to expect once I graduate and enter the real world of television news,” Howerth says. Interview concluded, he heads back to another desk, drops that one knee on the floor and starts asking questions of yet another student working on her news story.